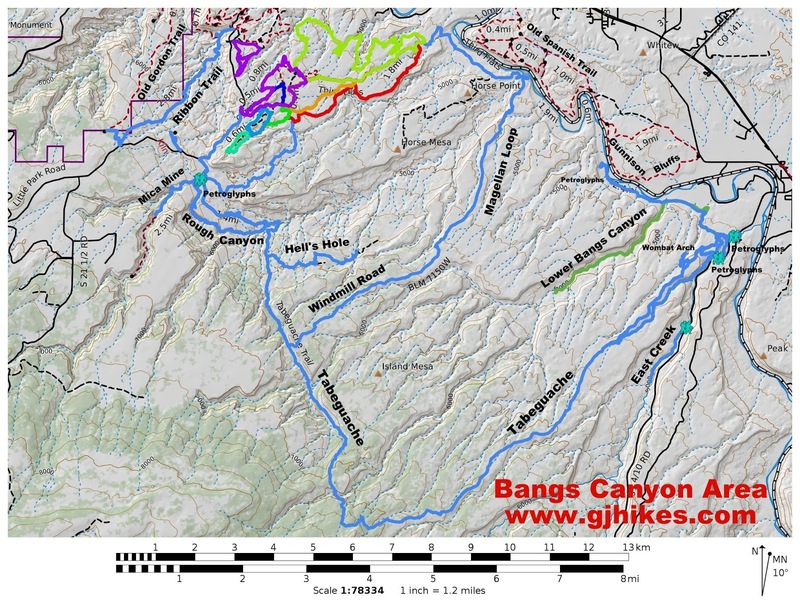 The Bangs Canyon CWP, or Citizens Wilderness Proposal, is a 21,110 acres parcel of the BLM's Bangs Canyon Management Area south of Grand Junction. An 8 mile section of the Tabeguache Trail passes through the midst of the area. Colorado Highway 141 and the Gunnison River for the south and east boundaries. I have read the CWP several times but I haven't formed a personal opinion, as yet, on its merit. I do like the idea of protecting the area and I plan more hikes there in the future. There are several small parking areas on both sides of Colorado Highway 141 at the point where the Tabeguache Trail crosses the road. I was able to find a place to park on the north side of the road next to a pickup belonging to a squatter that is camped a little ways up on a side trail. After passing through the gate the trail climbs through a rough section of rock as you hike up and out of the confines of Unaweep Canyon. There were plenty of cactus and wildflowers in full bloom through here and the entire hike. After hiking barely more than a quarter mile the trail had leveled off considerably and I had reached a 4-wheel drive road. The Tabeguache trail follows the road for the trails entire stretch through the Bangs Canyon CWP. I wanted to explore the Tabeguache Trail section so I went to my left and followed the road deeper into the area. If you follow the trail to the right you will come to private land. 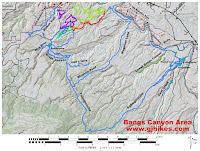 Another hike, that I will post at another time, cuts directly across the road into the Lower Bangs Canyon area. I continued to hike along the Tabeguache Trail for almost another 3 miles until I came to a fence that crossed the road. The hiking had been very fast and easy up to this point. While coming up the road I noticed that there were canyons on each side of me and that they seemed to be coming closer together. I had walked over and peered down into the canyon on my left and it seemed very hikable. Since that canyon paralleled the Tabeguache trail pretty much all the way back I decided to make it my return route. The canyon was easy to follow for the most part. There were a few tight section that I avoided by hiking a little higher above the dry stream bed. The wild flowers were larger and more abundant in the canyon. At one point I scared up a Great Horned Owl. I sure would like to get one to sit still for a picture someday. There were a couple of rocky places that could have been easily bypassed on well worn trails but they were a lot more fun to scramble over. They weren't anything that was even close to being perilous in nature but they lent a more adventurous feeling to the hike. As I hiked down the canyon I was keeping an eye on my Garmin GPS that was displaying the map of the hike up to that point. I could see that the canyon stayed in lock step with the ridge that I had hiked out on and wasn't leading me off into some unknown direction. I wasn't long before the canyon came to an end where it spills over into East Creek. I was still over a mile from the trailhead so rather than jump over the edge, to my death, into East Creek I climbed up a short distance to where I could see further. There weren't any well worn trails but it didn't look too difficult to follow the cliff on around to the mouth of the canyon. If I changed my mind it looked like there were plenty of places I could climb back up to the Tabeguache Trail. The hike around the cliff was actually pretty fun. There was one spot where I had to shimmy down some boulders but other than that it was mostly just putting one foot in front of the other. I got to see a lot more of the area taking this route. Since the cliff is just above the highway I was a mostly unseen observer of all the traffic going through and it consisted mostly of motorcycles, antique cars and Corvettes. I heard later they were having a rally of sorts at Gateway. It's something to think that the Gunnison and Colorado Rivers may have both flowed through here at one time and been responsible for the cutting of Unaweep Canyon before they were both hijacked and put to work on Horsethief and Ruby Canyons. This area gets quite a bit of use from hikers and mountain bikers that are riding the Tabeguache trail. There is additional parking across the highway. Just be careful crossing the road as it has blind curves in both directions. If you want to check out the Bangs Canyon CWP and see what all of the fuss is about then read up on the 'nearly 2 dozen rare plants and animals' that you can watch out for and go 'Take a hike'.